Wind mills have been around for hundreds of years but the earlier ones were believed to have been used more to produce mechanical power rather than electricity. Today, wind turbines are built mainly to generate electricity both in the sea and on land. They come in a variety of sizes, ranging from 2.5 metres in diameter and 1 kW for residential applications up to over 100 metres in diameter and over 3.5 MW for offshore applications. 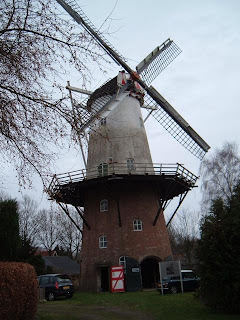 One of the windmills that is still working is Veldkamps Meul'n mill in Bellingwolde, Netherland. The mill was built in 1855, with four-blade rotor in the traditional dutch design. At that size and height it remained the tallest structure in the neighbourhood for sometime. The windmill is thought to be able to generate about 18kW of usable mechanical power. If this was hooked up to an efficient alternator, it might be able to convert up to 80% of that, i.e. 14kW or so into electrical power. Big gap in efficiency is expected. But by how much? This Veldkamps Meul'n mill has a sail diameter of 20 metres, whereas modern wind turbines used for large-scale power generation are generally at least 40 metres across. They have a power output of about 500kW. Hence, a scaled-down modern turbine would still generate 125kW. Modern wind turbines are nearly nine times more efficient. The point is that, technology advances with time and with this technology, man generates electricity without emitting carbon dioxide. But not without public complaint though. I don't live near wind farm and I can't testify, but from readings, huge wind turbines produce unwanted noise and some people think they are unsightly, too. I suppose there's a price to pay for everything. Nothing is free! Do we have wind turbines in Malaysia? Yes, but they are at best for educational purposes only. Our location near the equatorial line means we have less usable wind compared to countries further up or down the globe. We have the 100kW wind turbines in Pulau Perhentian Kecil Terengganu, the 0.3kW - 3kW wind turbines at UPM-Serdang main campus, etc., but nothing on large scale. Your post reminds me of my childhood where my father had installed a sort of traditional fan made of bamboo (tagarangon). It works thru wind power and is used to scare aware the burung pipit eating the padee, it has a very loud hissing sound..amazing. If not mistaken, at the place where my father planted paddy long ago, they called this traditional fan 'tongkisus' because it rotates (kisus). Some engineering write-ups in Malay were seen to have adopted the term kisus. Not sure though if it's widely used. I thought there is one in Pulau Layang-layang,Sabah and do you know that the first wind turbine in M'sia is installed in 1920 in Sungai Lembing. forgot to mention the supposedly 150kW wind turbine ,hybrid, at pulau layang-layang. I hope it's still working, it'd better be, because they don't have much choices there. Thanks for the pointer on the Sungai Lembing installation. Very interesting. 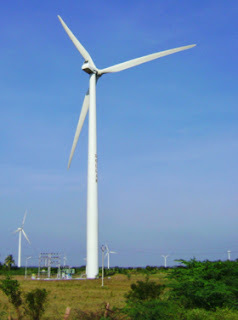 what about the Pulau Kapas wind turbine?